This recipe is probably my proudest veganized creation. I would even go so far as to say that this can one-up any classic caprese. It was born one day, when I was craving one of my favorites: grilled cheese with tomato. But I hadn’t yet came up with a suitable substitute for the cheese. So, like I do most times when cravings strike, I hit the kitchen. This vegan sandwich takes the classic caprese sandwich to a whole other level. Add all the ingredients except tapioca starch to a blender or nutri ninja. Blend until completely smooth. At this point, you can taste test and adjust as you like. For acid add lemon juice, for salt add miso or salt, for cheesiness add nutritional yeast. Once blended smooth, add the tapioca starch and blend once more until combined. Pour cheese mixture into a pan on medium heat and stir constantly. It will start to thicken up quickly. Once it is stretchy and gooey and there is no liquid-y parts, remove it from the heat: your cheese is done! 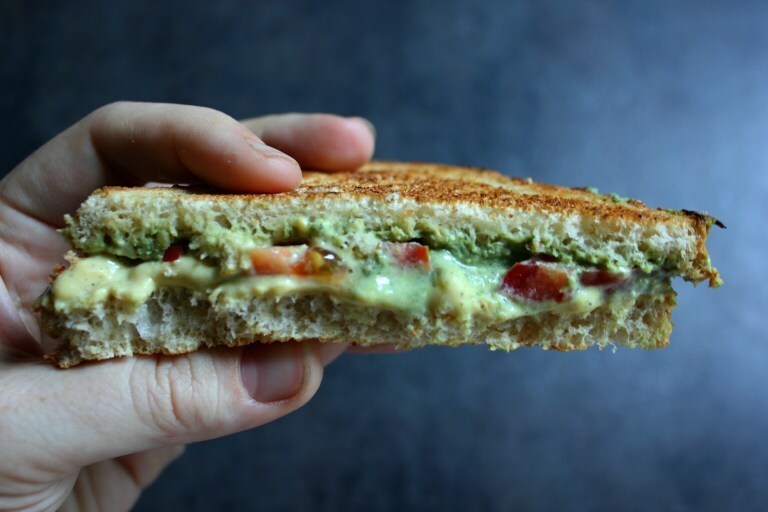 Spread 1-2 tablespoons of pesto on one slice of bread and 2 tablespoons of cheese on another. 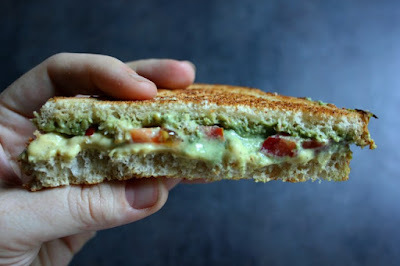 Add sliced tomatoes on top of the cheese and add the pesto-covered bread on top of the cheese-covered bread, pesto side down. Add the sandwich to a pre-heated pan on medium heat. Cook sandwich for about 2-4 minutes on each side or until toasted golden brown. 1. Weigh down your sandwich by placing a plate on top so that that it gets evenly toasted. 2. Heat up your pan for a few minutes before adding your sandwich so both sides cook in the same amount of time. 0 Response to "PESTO CAPRESE SANDWICH"